You are currently browsing articles tagged Records. Just another quick message to let you know that this afternoon we reached another milestone total – 6000 records have now been enhanced! For something nice to look at, too, I’ve added a photo of one of the nicest (and certainly most detailed) pencil sketches I’ve come across whilst working through the catalogue records. 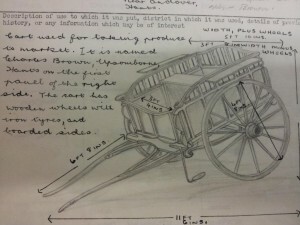 A pencil sketch of 55/300, a cart used in Hampshire for taking goods to market. Saddlery, wagons and ploughs, oh my! Apologies for the Wizard of Oz reference in the title – I couldn’t help myself. To finish the week, I thought I’d post an update on what I have been working on over the past couple of weeks. We recently asked some of our MERL tour guides for feedback about what sort of objects visitors seem to be most interested in, with a particular interest in place. The answer that came back was “wagons and ploughs”. This didn’t really surprise me, as I remember on my own first visit to the museum I immediately wanted to find a wagon from Worcestershire, the county in which I grew up. As it turns out, we don’t actually have a wagon from Worcestershire, but we do have plenty from many other counties. I spent a few days enhancing the catalogue records for all the wagons in MERL’s collection, and after than moved on to the ploughs. Cataloguing in this way does have certain advantages. Spending a number of days immersed in information about a particular type of object gives you a much better chance of getting to understand those objects, and what is most relevant and important to record about them. This is particularly useful when trying to tidy up the object name thesaurus for such objects. In contrast, if you only catalogue one wagon in every 300 records it is much harder to get an overall picture of wagons and their variations. 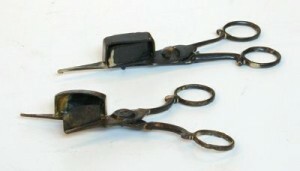 Of course, it does help when you are interested in the objects you are spending up to week cataloguing exclusively. On the other hand, cataloguing chronologically gives a really good insight into the history of the collection and how it developed over time, as well as being a logical and consistent way to progress towards our goal of 10,000 records by the end of the year. It is interesting to consider how the order in which we catalogue objects might be influencing the way in which we are cataloguing them. As well as the wagons and ploughs, I have also catalogued the objects in one particular gallery location: the saddlery case in the ‘Leather’ section of the Museum. This is part of a small part of the project I am working on, where we’re trying to think of ways of making the enhanced catalogue records more accessible to visitors who are actually standing in the Museum, looking at the objects. One of the ways we are thinking of doing this is using QR codes. This is one outcome of our work with iMuse (see Working with iMuse and Historypin), and we have been able to think a lot about the benefits and practicalities of using QR code technology in a museum context. Now that all of the objects in the saddlery case have been enhanced, we will be able to generate a QR code which, when scanned using a smartphone, will direct the visitor to the enhanced database entries for those objects. As a starting point, this should enable them to access far more information about the objects than would be possible with in-gallery text labels. Of course, QR codes aren’t perfect: not all of our visitors will have smartphones, for a start. As an initial idea to trial, though, we hope that it will give us some useful feedback with which to move forward. 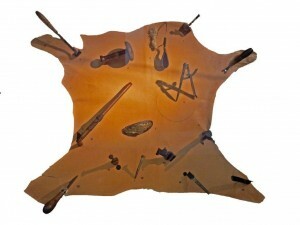 One of the displays in the Saddlery Case, one area of the gallery in which we will be trialling the use of QR codes. In the absence of a ‘Blue Peter’ style counter, I am confined to a mere blog post to let you know that we have now catalogued over 5000 records! Next target: 6000.